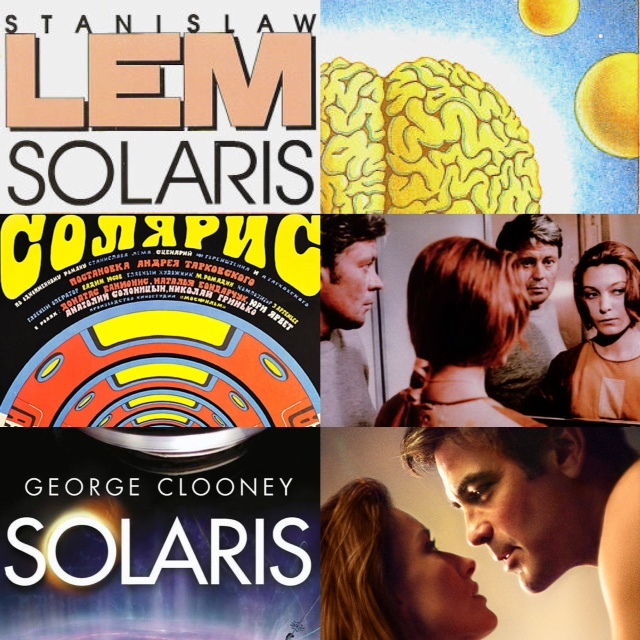 In this installment of Kino Klatch podcast we’re discussing Andrey Tarkovsky’s highly acclaimed sci-fi film Solaris (1972) together with the original novel written in 1961 by Stanislaw Lem and the 2002 Hollywood version directed by Steven Soderbergh. And in order to tackle this wide-spanning comparative analysis my usual Kino Klatch partner Derek Walker and I have invited our good friend Wickham Clayton to help us with it (Wickham is soon to become a Dr. in film and media studies. Do check out his two blogs: an academically-bent one and a more casual one.) It turned out be a nice and fruitful discussion with a few good laughs. Do have a listen and share you thoughts on it as well as Solarises themselves in the comments section. We look forward to reading them. The protaginist, Dr. Kris Kelvin, is a psychologist who is sent to a space station that hovers around the mysterious planet Solaris. The mission to research the planet seems to have gone astray and Kelvin is sent to investigate what has gone wrong. While on the station, however, Kelvin realises that each surviving crew member seems to have a ‘visitor’ – Solaris has the ability to manifest their secret, guilty concerns in physical form, for each scientist to personally confront. Before long Kelvin’s wife Rheya (Hari in Tarkovsky’s film), who had commited suicide many years before, or rather a copy of her, appears on the station. Despite the fact that the copy has been created out of Kelvin’s memory of her, that she is effectively immortal as long as she is in the domain of Solaris, and that she seems to be physically unable to be away from Kelvin, she is a fully formed human, with consciousness, feelings and intelligence. Emotional torture and profound philosophical ponderings ensue.